● Cast combination chains are made from cast steel for high strength and long wear life. These chains are used extensively in cement, chemical, wood products, quarries, and mining industries for conveying or elevating applications. Pearlitic malleable iron link is also available. 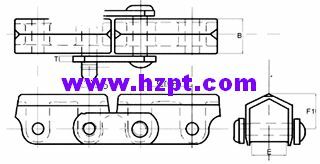 ● Narrow Series Mill Chains are used primarily for drag conveyor service in the forest products industry, but are also used in many other applications where a sliding chain is required. The closed joint construction permits operation in a moderately dusty or abrasive atmosphere. 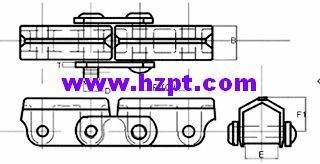 ● 400 Class Pintle chain are low cost malleable iron products which are widely used for power transmission, conveying or elevating applications. 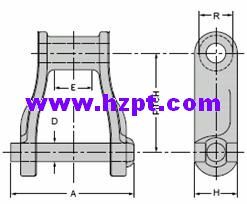 These chains are available in cottered or riveted construction. Designed to operate on the same sprockets as Detachable chains,400 Class Pintle chains often replace Detachable chains due to their higher strength and greater load carrying.